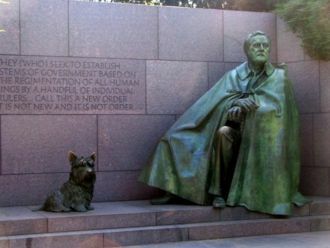 The Franklin Delano Roosevelt Memorial is a presidential memorial dedicated to the 32nd President of the United States Franklin Delano Roosevelt (1933-1945) and the era he led the United States through. The 7.5 acre memorial was dedicated in the year 1997. One of the many statues at the Memorial. This page was last modified on 1 May 2018, at 16:34. This page has been accessed 2,886 times.